I decided to spend a little time tinkering with a Raspberry Pi 3 and a Camera module and wanted to share some of the things I’ve been learning. My current setup is a Raspberry Pi 3 running Raspbian Pixel, with a 10.1″ HDMI LCD display from Waveshare.com (~$80) with their RPi Camera ($19). 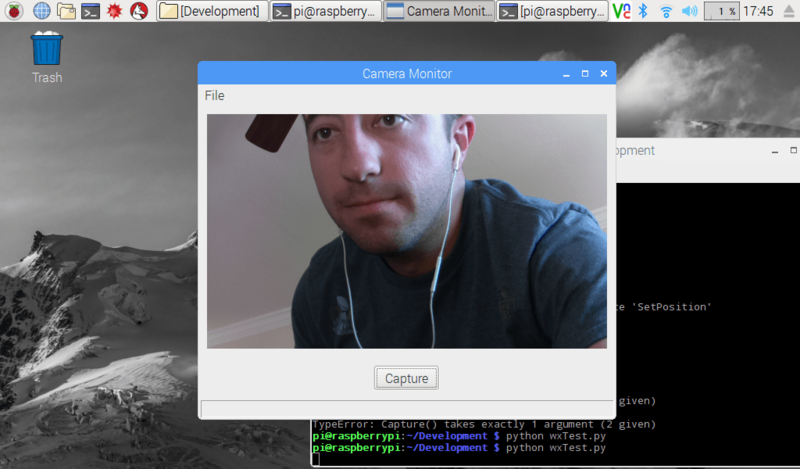 There are great resources available for getting started using the Camera in Python, but I haven’t come across any tutorials about how to combine the camera with an actual graphical user interface (GUI). The first decision was to figure out which GUI toolkit to go with. I came across Bald Engineer’s post deciding to go with a Qt solution but I decided to go with wxPython. The main reason is that it seems to be easier to throw together a lightweight UI in wxPython without having to use a UI Designer tool and then cross compile and generate Python bindings like Qt. (Note, I’m not an expert at Qt, so there may be simple lightweight solutions that I’m not yet aware of). Initially the new wx namespace wasn’t available in Python so I rebooted the Raspberry Pi and was good to go. The Raspbian Pixel should already have the picamera module installed which lets you quickly capture and save images. Note that out of the box the picamera module does not have any way to show the camera picture in a windowed mode, hence requiring us to get our hands dirty. With wxPython it’s pretty straightforward to create a UI with a wx.Image box and a button to save the camera image to a file then present it to the user. This is a trivial example, in the future I’ll work on switching the capture to use a memory stream instead of a file and also go multi-threaded to allow the camera stream to update without halting the UI. # Setting up the menu. # wx.ID_ABOUT and wx.ID_EXIT are standard ids provided by wxWidgets. self.SetMenuBar(menuBar)  # Adding the MenuBar to the Frame content. # adding stretchable space before and after centers the image. # You can fit the frame to the image, if you want. # A message dialog box with an OK button. wx.OK is a standard ID in wxWidgets. dlg.Destroy() # finally destroy it when finished. self.Close(True)  # Close the frame. If this post was interesting or helpful, or leaves you with any questions, please drop a comment in the space below. why i get ‘invalid character in identifier’? can you tell me why it was there? If I press Capture, the image is saved and displayed in the window. Re-running the script results in the captured image being displayed in the window, not the camera preview. Ooop, yep. Probably need to add something like if os.path.exists(“image.jpg”) before line 28. Thanks for the feedback!